Get started with a Free Quote Now! Local SEO reaches customers in your area and gets them into your store. How does an SEO strategy take searchers from their device to your shopfront? By leveraging the need for fast service and immediate results. Millions of people search for nearby companies online every day, with a huge 97% of consumers searching online to find services near them. For your business, this means drawing in new customers for their convenience – and holding onto them with your services. If you have a physical store, or your business targets a certain area, local SEO is essential. This effective subset of SEO uses a range of methods to promote your business’ visibility in location-based searches. Ever used the phrase “near me” at the end of a search, or included your city’s name in it? Search engines pick up on the location specified, curating results according to distance and relevance. This comprises both the essence and foundation of local SEO strategies. Local SEO is highly targeted by nature. A clear majority of local searches are conducted with the intent to find a specific business, service or product – and this intent is even stronger for mobile searches. 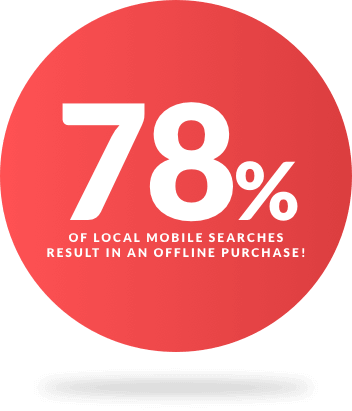 In fact, 78% of local mobile searches result in an offline purchase! By focusing efforts into a particular geographical zone, you’ll be connecting your business to customers when they need you most. This massive rise in mobile searches has contributed to local SEO’s status as one of Hong Kong’s most turbo-charged lead-generation strategies. As a specialist digital marketing agency, we are proud to help businesses of all sizes achieve their goals. Because local SEO is an organic technique that doesn’t rely solely on budget, it’s highly effective for smaller businesses. Organic techniques let you rise through the ranks based on the relevance of your website to key phrases and website quality, so a small budget won’t get in the way of your business achieving real results. When local campaigns gain traction, they have the potential to land you a place in the local pack. 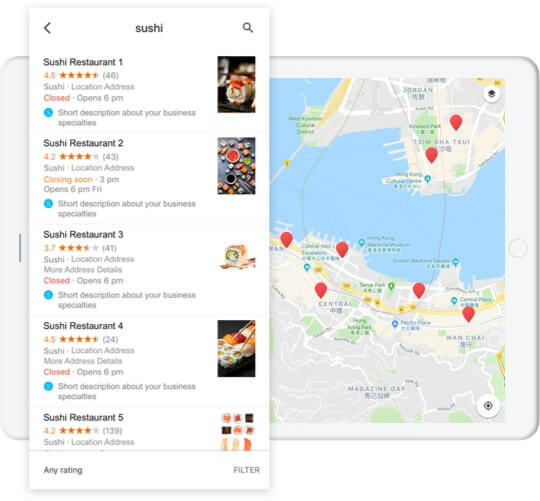 The local pack are the first businesses that appear for geographic searches, highlighted by Google for maximum exposure. This coveted spot puts your business in a prime position to attract local leads who are ready to buy – now. A central aspect of any local campaign is the setup and optimization of Google My Business (GMB). 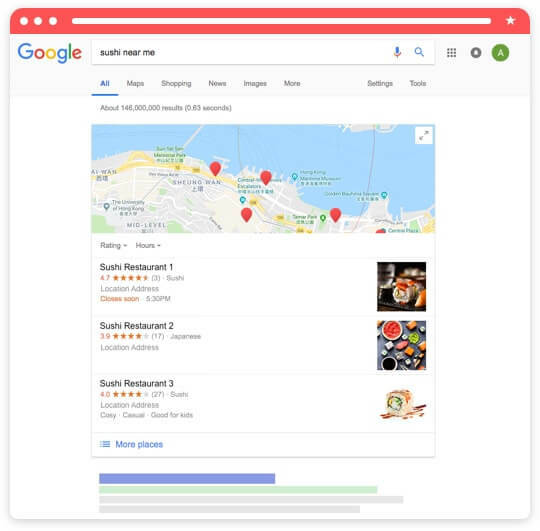 This is an interface which determines how your business gets displayed on Google products, including Maps, search engine results pages, reviews and more. Optimizing GMB gives you a competitive edge – only 44% of businesses have claimed their GMB listing, so take the opportunity before your competition does! Our local SEO specialists design campaigns that sync with your business areas, creating upward movement in search engine rankings for the region. Using on-page and off-page methods, you’ll get a dynamic campaign that spans and focuses on your prime geographic locations. 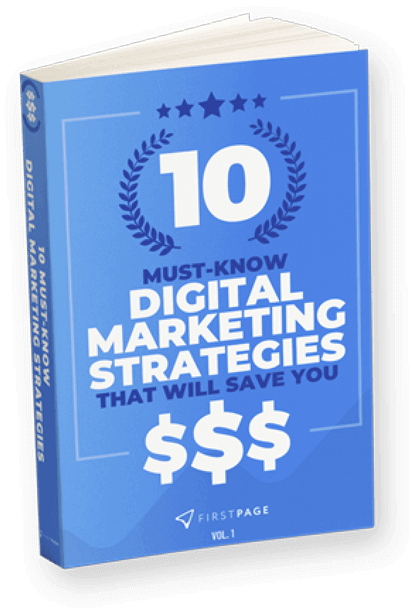 This keeps your website – and business – squarely in the sights of those who seek out your services, resulting in more leads and more sales. Remember phone books? Think of this strategy as giving your company a featured ad position in a digital business directory. For local SEO campaigns, our agency sets up and showcases your business in prominent online directories throughout Hong Kong. With skillful optimization, you’ll experience the compelling conversion rates that makes local SEO so worthwhile. Ready to maximize your local presence? Start with a free local SEO quote!